Woo-hoo! Calling all Puppies!!! Introducing EZComplete fur Dogs!!! It's true! EZComplete Fur Dogs has arrived!!! Now you can offer your dogs a complete and balanced homemade diet as EZ as 1-2-3! Simply add EZComplete to raw or cooked boneless meat, add water and mix - you are done! Featuring a similar formula to that for cats, EZComplete fur Dogs premix contains liver and pancreas as the nutrient and enzyme-packed organs; combines freeze dried bone (calcium hydroxyapatite) and eggshell as sources of calcium. Dogs thrive with a higher bone content than cats, having a higher requirement for many minerals. And by substituting a percentage of the bone for eggshell calcium, EZComplete Fur Dogs meets the needs of puppies, pregnant dogs, and nursing moms – while keeping a lower overall phosphorus content for senior dogs. Egg yolk, a true nutritional powerhouse, is rich in choline and vitamin E, and brings almost every nutrient our pets need. New Zealand green-lipped mussels provide a unique combination of anti-oxidants, anti-inflammatory omega 3s, and are rich in glucosamine and chondroitin, important in joint health. Digestive enzymes bring many benefits, reducing organ stress, improving digestion, and increasing nutrient utilization. These are an important inclusions especially for those that opt to cook the meat, as cooking destroys the naturally occurring enzymes in the meat. Tragically, one out of every two dogs will be diagnosed with cancer sometime in their life. Thus, we view the addition of kale, brussels sprouts, carrots and blueberries a valuable inclusion to the diet, important in helping to reduce their cancer risk. Finally, a few vitamins and minerals are included to account for what is missing by not feeding whole prey. 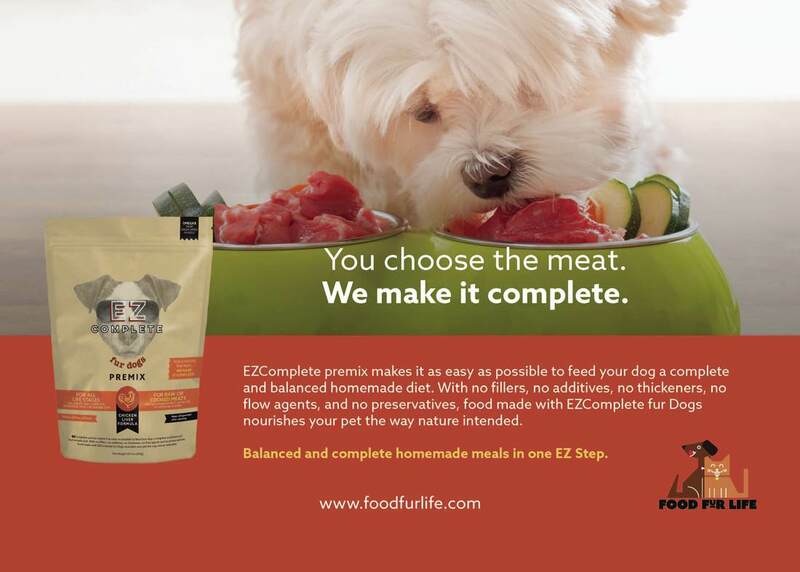 With EZComplete fur Dogs, dog moms and dads will be able to control the main ingredient, the meat, their pups able to enjoy fresh, truly human grade meat, so easy to make complete & balanced with EZComplete! ​We look forward to helping puppies and adult dogs thrive as EZComplete has done for kittens and cats! Tired of Hairballs? Food Fur Life Proudly Introduces - The Incredible Edible (EZ) Egg (Yolk)! We are proud to announce that human grade – no additives, no flow agents – powdered EGG YOLK is joining our product line-up! Are you tired of Hairballs? Did you know that egg yolk is one of the best natural hairball Preventatives? As discussed in our article - Hairballs - How Best to Manage Them, Egg yolks provide many nutritional benefits, but what concerns us as far as hairballs, are specifically the choline and lecithin. Choline. A component of choline is acetylcholine. Acetylcholine acts as a major neurotransmitter for the autonomic nervous system (which includes the GI tract). The stomach and the intestines contain a muscular layer that allows for wave-like contraction of the organs, known as peristalsis. This process propels food through the digest tract. The National Digestive Diseases Information Clearinghouse states that acetylcholine increases the contractions seen in the muscular layer, thus improving peristalsis and pushing food efficiently through the digestive tract. Choline (and its component acetylcholine) improves GI motility, which is what propels hair through so it comes out the proper end. An species appropriate diet, brushing regularly, and adding egg yolk to your kitty's diet are great natural ways to prevent the oh-so-dreaded hairball problems. But wait! There is much more! “What's so special about egg yolk?” you ask? Eggs are a nearly perfect food, and the yolk contains the bulk of that nutrition. Discussed as “nature’s multivitamin” in many articles, eggs are truly a powerhouse of nutrition as one of the most nutrient dense foods on the planet. With almost every essential vitamin and mineral our pets’ bodies need, egg yolk is the perfect superfood complement to any diet – and essential in a homemade diet, most notably for choline which almost always come up short without the addition of egg yolk (or whole egg). Choline is vital to proper nerve & muscle function and normal liver metabolism. Without adequate choline in the diet, there is a higher-than normal risk of chronic liver damage (and eventual liver failure). Choline helps protect against age-related declines in cognitive function. In humans, choline has been shown to play an important role in preserving memory, and low acetylcholine (a component of choline) levels are associated with the development of Alzheimer’s. Finally, of particular importance for our cats and ferrets, choline aids gastrointestinal motility, which is why egg yolk is an incredibly effective tool in preventing hairballs, as addressed above. Egg yolks are also one of nature’s richest sources of biotin. Biotin supports healthy metabolism of fatty acids, amino acids, and glucose. It is essential for healthy thyroid and adrenal function, a healthy cardiovascular system – it also protects brain function and fights cognitive decline. However, biotin is probably most renowned for its role in healthy, beautiful skin, hair and nails. In our pets, this means egg yolk will contribute to soft, silky, shiny fur; aiding in resolving dandruff; and helping to prevent cracked dry nails and fungal infections. To learn more about the benefits of egg yolk, we discuss each ingredient in the EZComplete premixes, including egg yolk, here. Of course, the EZComplete fur Cats and EZComplete fur Dogs premixes already contain the egg yolk needed to provide a balanced diet. But if your dog, cat or ferret has a health issue that would benefit from a multivitamin - consider egg yolk! Or if your dog has dandruff, or your cat or ferret is suffering hairballs, consider supplementing with egg yolk. And as fats moisten stool and increase transit time, if your pet is prone to constipation, reach for the egg yolk. It is a terrific tool for managing chronic constipation. Some pets may also need an osmotic laxative like lactulose, or a bit of fiber. But for our carnivores, this is the species-appropriate place to start. For those that have pets that do not enjoy natural, raw yolk, or for those of you that need to cook too many eggs to be practical, we've done the work for you. EZ Egg Yolk is a very easy-to-measure and use alternative! Please Welcome Dogs to Our Furry Family! It’s official – Dogs are finally a part of the Food Fur Life family! Since we opened for business, we have been asked time and again why we have a dog in the logo, but no product for dogs? As many self-funded small companies, we had to make choices, to prioritize. It isn’t because we don’t love doggies just as much! The dog in our logo is Carolina’s Bruce Wayne! 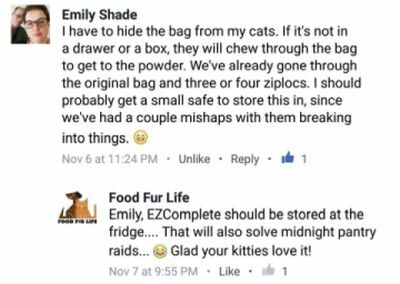 We felt strongly that cats are under-served and in higher need of a premix to balance homemade diets, and we launched EZComplete fur Cats first. But we worked hard to make EZComplete fur Dogs become a reality – and here we are! We are THRILLED to introduce EZComplete fur Dogs, officially welcoming our woof, tail-wagging friends to our Food Fur Life Family. Featuring a similar formula to that for cats, EZComplete fur Dogs premix contains liver and pancreas as the nutrient and enzyme-packed organs; combines freeze dried bone (calcium hydroxyapatite) and eggshell as sources of calcium. Dogs thrive with a higher bone content than cats, having a higher requirement for many minerals. And by substituting a percentage of the bone for eggshell calcium, EZComplete Fur Dogs meets the needs of puppies, pregnant dogs, and nursing moms – while keeping a lower overall phosphorus content for senior dogs. Egg yolk, a true nutritional powerhouse, is rich in choline and vitamin E, and brings almost every nutrient our pets need. New Zealand green-lipped mussels provide a unique combination of anti-oxidants, anti-inflammatory omega 3s, and are rich in glucosamine and chondroitin, important in joint health. Digestive enzymes bring many benefits, reducing organ stress, improving digestion, and increasing nutrient utilization. These are an important inclusions especially for those that opt to cook the meat, as cooking destroys the naturally occurring enzymes in the meat. Tragically, one out of every two dogs will be diagnosed with cancer sometime in their life. Thus, we view the addition of kale, brussels sprouts, carrots and blueberries a valuable inclusion to the diet, important in helping to reduce their cancer risk. Finally, a few vitamins and minerals are included to account for what is missing by not feeding whole prey. EZComplete Fur Dogs will be launched at the SuperZoo, Las Vegas, July 25-27th, and will start shipping 1st week of August. Mark your Calendars!!! We look forward to helping puppies and adult dogs thrive as EZComplete has done for kittens and cats! PS. Look for our ad on Dogster Magazine! 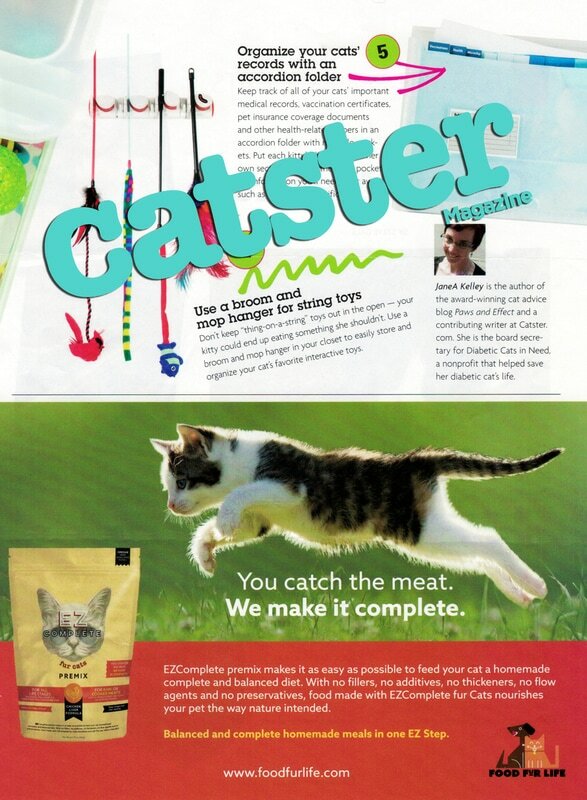 As Seen in Catster Magazine - New Packaging Coming Soon! Dear Food Fur Life Family, you will soon start receiving our brand new "Stop Light" EZComplete Bags! Based on the feedback we accumulated since we opened our Company, combined with the advent of the upcoming launch of our EZComplete Fur Dogs, our packaging has been redesigned, featuring several GREAT updates. The bags are the same, made of the same FDA approved Mylar BPA free material. There were no changes to the formula. We decided to have printed bags instead of labels, allowing us more live space for information. ​Now you can readily find all the information on how to prepare EZComplete right on the bag: batches, single meals and cooked! How to transition your cat? Also there! Feeding guidelines and suggestions for all life stages - adults, kittens and mommas - on the bag! We made it as easy to read and understand as we possibly could. The information is in OZ and Metrics. For those who see the Catster ad below, please note - We will start to ship the new bags as we phase out of the current inventory - Large bags sooner, and small bags a little later.... Probably mid-June the East Coast and International customers will start receiving the large new bags. If you receive the current (Black) bag, please be advised that the product is the exact same - including the material of the bags. The only change is the bag design. Does your cat frustrate you with loving her food one day – and hating it the next? You might be surprised to learn that the problem could be the nutritional profile of the food you are offering her to eat, not the taste. Of course, cats experience nausea when ill. 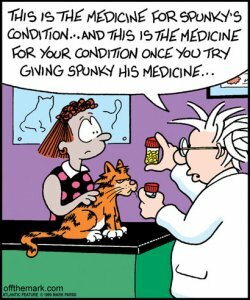 But a recent study indicates our apparently healthy kitties may have a sound reason for being finicky felines after all. “Balancing macronutrient intake in a mammalian carnivore: disentangling the influences of flavour and nutrition” found that – after a period of introduction to the food textures and flavors – aroma, taste and texture of food was not as important to cats as the macronutrient content of the food. “Macronutrient” content refers to the basic composition of the diet: protein, fats and carbohydrates. As we have discussed before, cats naturally consume a diet that is over 60% protein, about 20% fat, and has almost no carbohydrates (on a dry matter basis). As fat provides almost twice as many calories as protein, this equates to cats obtaining about 52% and 46% of their energy needs from protein and fat, respectively. (The diet they naturally consume provides just 2% of their energy from carbohydrates). In this study, cats were introduced to three basic new foods. These were wet foods with the texture of porridge. The flavors were fish, rabbit and orange. (!!!) Each food was initially formulated with a similar protein-to-fat ratio. The cats showed a strong preference for the fish-flavored food: rabbit was “neutral,” and orange flavored food disliked. No surprise there, right? 70% protein and 30% fat. When fed with those three different protein-to-fat options but offered just one flavor at a time, the protein-to-fat ratio of 70%/30% won as the favorite food, paws down. Then the cats were offered the varying protein-to-fat ratios with a mix of flavors such that the cats would have to eat orange flavored food in order to increase the protein in their diet. The cats ate a mix that averaged out to about 50% energy from protein and about 50% from fat, in line with the profile of their natural diet and the results of the 2011 study that eliminated taste preferences – even though that meant the cats had to choose to eat orange flavored food to achieve that mix of protein and fat. Take a moment to absorb that. Cats chose a nutritional composition over taste and smell. In plain English, this means cats respond not just to taste, smell or texture – their bodies prompt them to eat what they need from a nutritional standpoint! It bears repeating: cats actually ate orange-flavored food (after learning it was, in fact, food) in order to consume a diet that (from the perspective of the ratio of meat and fat in the foods) resembles their evolutionary diet. As we have discussed before, cats are a metabolically inflexible hypercarnivore, and it really should come as no surprise that the diet they naturally strive to eat is what they need. It may be surprising to some that THEY know they need this. The mechanism responsible for this is not yet known. But what is most likely surprising to most (if not all) of us is the response of their bodies to diet is so strong, in order to get the nutrition they need, cats will eat food a food with a flavor they would most likely never – under normal circumstances – elect to eat on a taste/aroma basis. The qualifier there? They need to have been introduced to the foods and learn that they ARE food. If given the opportunity – and, importantly – when properly introduced to the food – cats will choose the diet that best suits their needs. As Dr. Hewson-Hughes told Discovery News, cats display an eating characteristic called neophobia. "This means they are unwilling to try a food that is new or different to their normal food, which may make them appear fussy." If we offer our kitty new food, especially a new food format such as wet from kibble or homemade from kibble or canned, we can’t expect them to like it right away – and we may meet with quite a bit of resistance. Cats are naturally cautious eaters and when a new food looks, smells, and feels so different, it is a part of their life-saving instinct to be distrustful. This is why we have several files dedicated to assisting with the process that results in a successful transition. Cats may instinctively know what they need – but most need to go through the learning process to understand that even healthy, tasty food IS food. Another interesting aspect of this study explains why cats, when they do take to a food if based just on taste, can so often appear to change their minds. This study indicates that every time you feed your cat, her body tells her whether she needs more or less of the nutrients in the food you’re offering her. If it has the same mid- or low-level of protein as what you were feeding; or if it has a similar carb content- she may well refuse the new food after a meal or two, despite liking the taste at first. So rather than commit to that new case of canned food, consider making your own cat food. 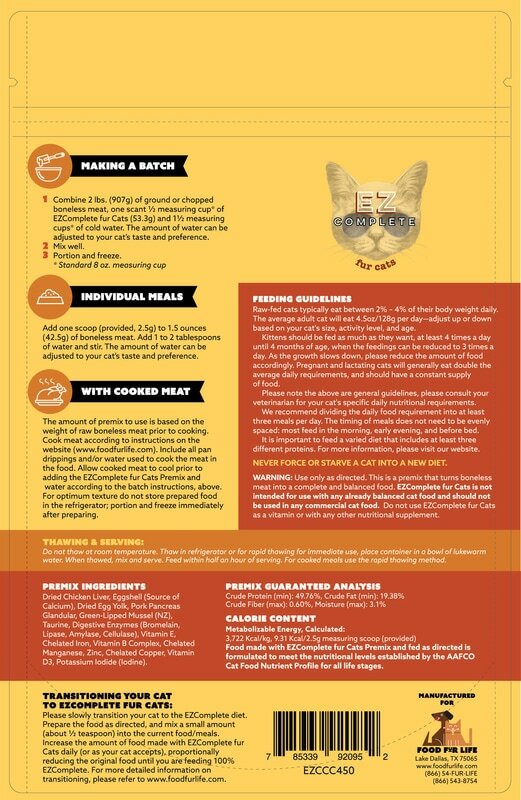 A homemade balanced and complete cat food based on the prey model is what your cat needs – and your cat’s body knows it. With balanced and complete assurances (and the ability to use boneless raw or cooked meats) when you make your feline friend food with EZComplete fur Cats, you control the types AND cuts of meat you feed your cat. You control the mix of meat and fat. You control the texture (and temperature). If your cat doesn’t want ground food, you can feed it chunked. If your cat doesn't like gravy, add less water. Food Fur Life provides the tools you need to feed your cat the food her body wants and needs. We are Running a Promotion in Honor of Healthy and Happy Cat Month!! 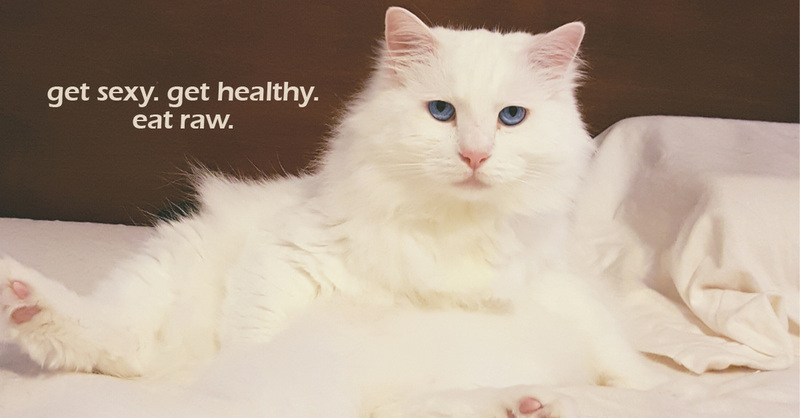 It's Healthy & Happy Cat Month! 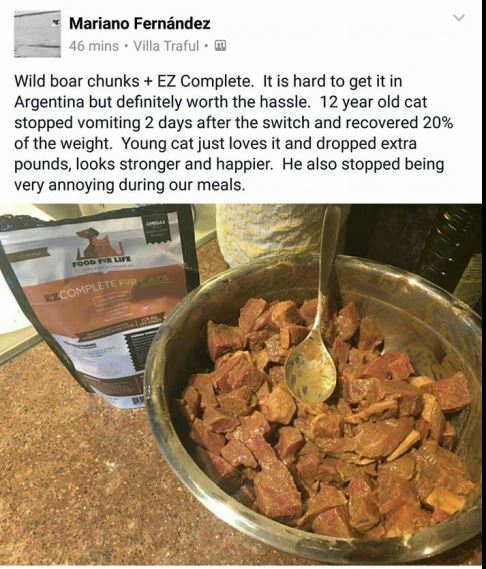 Feed your cat the way nature intended with EZComplete - Balanced homemade raw meals in one EZ Step. *Offer Expires on September 20th, 2016. Not Valid with any other offer. To keep up to date on Food Fur Life's News and Offers, please subscribe to our newsletter here. Food digestibility and nutrient bioavailability are at the heart of nutrition. Digestibility is a measure of how much nutrition a food provides in a given volume. It indicates how much of the food is absorbed by the gut (intestines) into the bloodstream. It is the difference between what your cat eats and what your cat excretes. Nutrient bioavailability is the proportion of the absorbed nutrients that are carried to target tissues and are available for use by the body. Because a highly digestible food provides a higher proportion of absorbed nutrients than a less digestible food, digestibility provides an important measure of a food’s nutritional value and quality. In general, as the quality of ingredients in the food increases, so will the food’s digestibility and nutrient bioavailability. To understand which foods will provide the highest digestibility to our cats, we need to understand a little bit about their physiology. We seek convenient food with our busy lifestyles. And most of us do not intuitively understand what cats need nutritionally to support their best health – they seem like little aliens. So we ask our vets. And despite the fact that 80% of cats over the age of three years have periodontal disease, many of our vets still tell us that for dental health, cats need kibble, and that to mimic their "natural" pattern of eating many small meals (being hunters of small mammals), we should leave the food out. We didn't know any better, and we trusted our vet to know what’s best for Bella. has virtually no moisture, and cats do not have a thirst-drive that keeps them properly hydrated. requires some form of carbohydrate to bind it together. While there are some lower carb kibbles, most contain between 20% - 40% or more carbohydrates. Cats have just one pathway for carbohydrate metabolism (compared to dogs and humans who have multiple pathways). Unlike humans, neither dogs nor cats have salivary amylase (amylase is the enzyme the body produces for carb digestion) - but cats have just 5% of the pancreatic amylase of dogs. may look high in protein, but it often turns out much of the protein is plant-based, not animal-based. is not just a highly processed food, it is an ultra-processed food, made from already highly processed ingredients. being subject to high heat treatment contains cancer causing agents created by that high heat processing. This discrepancy between cats' needs and the dry food format has profound implications for their health, as discussed in our article Cat Food vs Cat health. Many assume the influence of living among humans would have had an impact on what cats have the ability to eat and use for sources of energy and nutrition, as appears to the be case for dogs. Nope. Not so. Not at all. Despite their proximity to humans for at least 10,000 years, cats retain their unique anatomic, physiologic, metabolic, and behavioral adaptations consistent with eating a strictly carnivorous diet. That is to say that cats, to this very day, remain obligate carnivores – and not just obligate carnivores, but hypercarnivores. By their genetic makeup, cats must eat the tissue of other animals in order to thrive. If cats were in charge of the pet food industry, food instructions would read “remove mouse or rabbit from freezer, thaw and feed.” That idea makes many of us laugh and say, "My cat would never eat that!" That is only because they weren't raised eating properly (for a cat!) and usually have to learn to eat biologically appropriate fresh raw foods, having been imprinted to commercial food options, that use chemicals and flavoring to keep them eating. For cats, a highly digestible food is moisture rich, low carb, and made with fresh, high quality animal proteins. Merriam-Webster defines digestibility as “the percentage of foodstuff taken into the digestive tract that is absorbed by the body.” Simply put, it is the difference between how much food your cat eats and how much is excreted in stool. What they can’t digest, they excrete. Amount: 4.5 ounces per day. 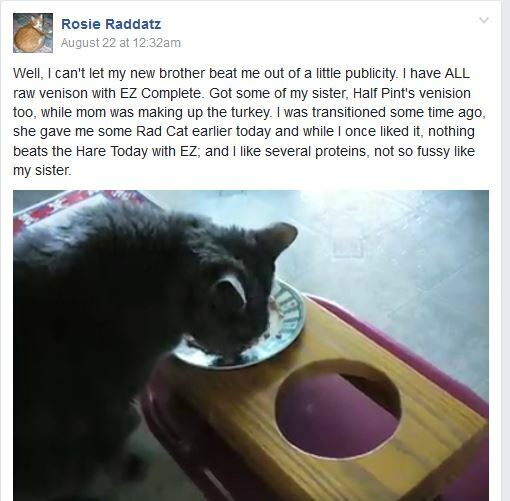 Food: Homemade raw food made with EZcomplete fur Cats using beef as the boneless muscle meat. Why does this matter? 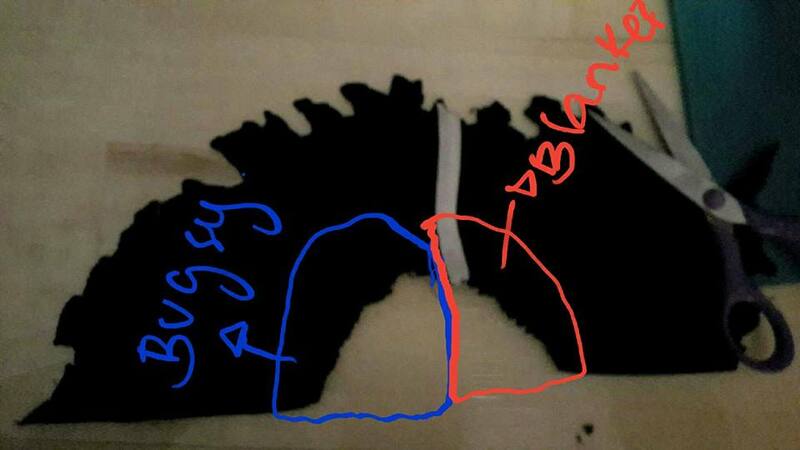 What does this illustrate? Let’s look at protein, being so important to a cat. To determine the digestibility of protein (or any individual nutrient), the amount of the individual nutrient in the stool is determined. 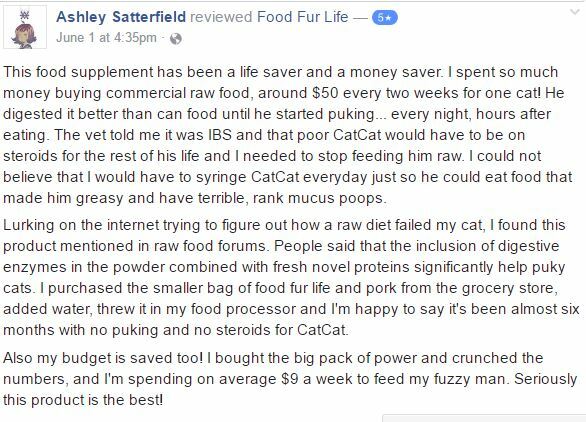 So if that 5.5 ounce can of food contains 19 grams of protein, and kitty excretes 3 grams of protein in the stool, kitty used, kitty absorbed, kitty metabolized 16 grams of protein. 16 grams of protein absorbed divided by the 19 grams of protein eaten = 84%. The protein in that food is 84% digestible. 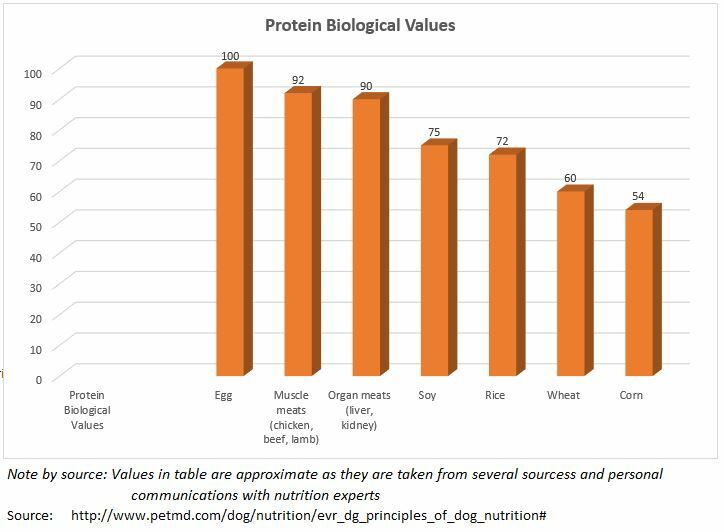 But different protein sources have differing digestibility due to their biological values, and different foods have varying ingredients that make the protein more or less accessible to the body. Example: Canned foods 1 and 2 both have 12% protein as listed on the guaranteed analysis. They both have the same moisture content of 72%. This means each 5.5 ounce can of food has about 19 grams of protein. Even though each can of cat food is labeled as having 12% protein and 72% moisture, and we expect they will provide the same amount of protein to our cat, they don’t. Food 1 provides more protein than Food 2. If we presume both canned foods have the same protein as the main ingredient, how can there be such a big difference in digestibility? Digestibility is impacted by many factors apart from protein sources, though protein quality is an important factor in digestibility of the food, and bioavailability of the nutrients. Differences arise from protein source, protein quality, the macronutrient content, other ingredient differences of the foods: the presence (or lack) of fiber, gums or thickeners, particle sizes, processing techniques, the temperatures achieved in processing – and, of course, the age and health of the animal eating the food. What Is a “High Quality” Protein? High quality protein is animal-based. High quality protein provides the 11 essential amino acids in proper proportions. The highest quality proteins come from fresh, raw human grade meats, not cooked meats, and not pet grade meats, which include diseased and downed animals in both canned and kibble cat foods. So how do we know which foods are highly digestible and provide the most nutrition to our cats? Comprised of whole, fresh human grade animal-based proteins and fat. This means homemade raw or a few commercial raw foods. Please note, many foods, even canned foods and foods marketed as “grain-free” foods contain non-meat based proteins such as soy or peas. These cost less than meat and that is the only reason they are there: to increase the apparent protein level of the food. Almost all commercial canned and kibble cat foods contain pet grade (waste product) meats and other ingredients, regardless of those pretty marketing pictures. Moisture-rich. Feeding moisture-depleted dry food, especially if it is free-fed, has resulted in alarming health problems in our cats, with obesity, periodontal disease, lower urinary tract diseases and kidney disease literally plaguing - and killing - our cats. Minimally processed. We know from human nutrition it is healthiest if nutrients are consumed in their natural, unprocessed, form. Not only can processing damage nutrients but science is starting to understand the importance of consuming some nutrients at the same time and in the same quantities as they naturally occur. The more we provide nutrients in an unnatural form, the more likely we are providing them in a less than optimal manner just because of things we don't know. 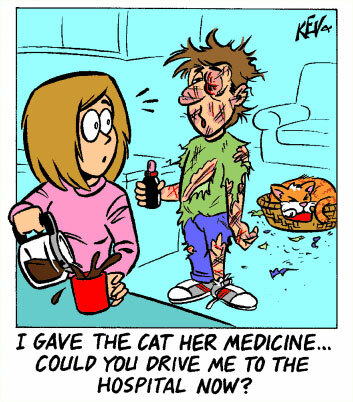 It is pure hubris to believe we have anywhere near a complete understanding of feline nutrition, and our cats are suffering because we feed them a highly processed diet with synthetic vitamins replacing those damaged by the process of making their food. Low in carbohydrates. Cats will overeat high carbohydrate foods in an attempt to derive enough protein, as energy from carbohydrates cannot replace their need for energy from protein. This puts them at risk for obesity, diabetes, and many GI disorders (principally fatty liver disease, inflammatory bowel disease and pancreatitis). Low in fiber. Unless a cat has an already damaged intestinal tract, a cat does not need fiber in the diet. Cats have one of the shortest GI tract-to-body lengths in the animal world: unlike humans, they are not physiologically meant to ferment fibers and their natural diet contains almost no plant-based fiber. Fiber produces bulky stools, and cats naturally pass very small, firm, odorless stool. Has no, or very little fruits and vegetables. If there are any, they are less than 5% of the total food and there only for antioxidant support. Only low glycemic vegetables (that are safe for cats to eat) should be used. The importance of feeding a cat a highly digestible, species appropriate diet cannot be ignored nor overstated, not only for its nutritional aspect, but also for the strain a highly processed diet puts on the digestive system of the cat, particularly on the pancreas, in trying to digest a food that is void of proper nutrients and enzymes, ultimately resulting in inflammation. Many of the top diseases our cats suffer are directly related to their diets and can easily be avoided by providing them with whole food-based nutrition.